I was first introduced to a savory custard by the wonderful food blogger, Helene Garcia of French Foodie Baby. The first savory custard I made was her leek and chive flan and I was a bit afraid at first because we just have ingrained in our minds that custards and flans are supposed to be sweet, but this was a very happy and luxurious surprise. 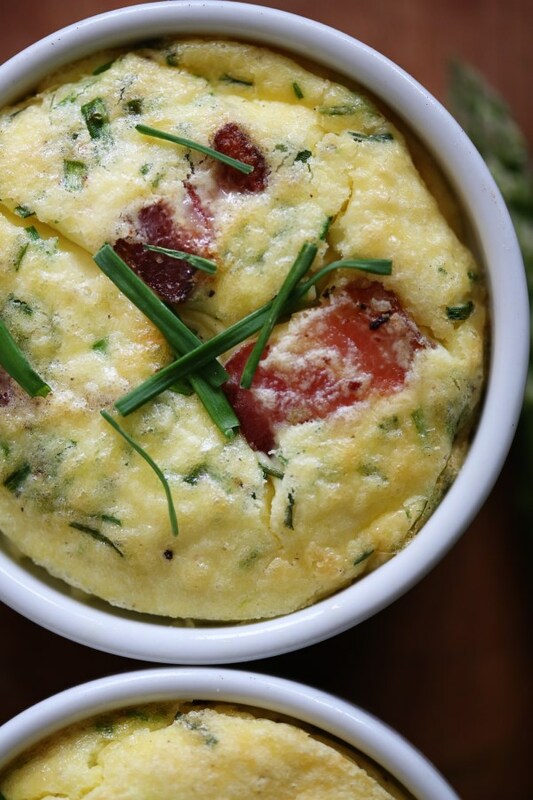 Basically, in American terms, this is a crustless quiche. Only waaaaay better of a texture than the quiche of your childhood. Please do refer back to my quiche post on how its texture should be. I was happy that it was such a silky texture and that Olive could eat it just fine with her limited spoon wielding skills. I stumbled upon this asparagus and bacon custard in a book called French Women Don’t Get Fat, which I’m reading and working my way through the steps to reshape my life and my patterns of eating. The book presents a bit of a strict start (a cleanse, which I don’t think is totally necessary for success, just optional) followed by three months of self evaluation of the patterns you’ve made over the years and ways in which you could cut back without feeling deprived. After three months, by the book, you should only be HALF WAY to your goal weight. If you are, then she advises to add back a few more pleasures and get on with your life! If not, then keep going with the plan, making additional adjustments if necessary. I’m happy to have finally found a book that doesn’t restrict you, doesn’t say that a particular food or food group is bad, and doesn’t push supplements. I’m DONE with that vicious cycle of crash dieting and then giving up, gaining back and doing it all over again because every new diet makes a new promise. Why do we keep doing this to ourselves? I found myself having an epiphany the other day that a diet that promises you’ll lose all the weight you need to lose in a few weeks will only work if it only took you a few weeks to gain that weight. And like me, I’m sure most of us with serious weight issues have struggled a BIT longer than weeks or even years with our weight. So why does it not register in our minds that in order to keep a good, healthy weight, we should logically change the way we do things for 10-15 years at least? Personally speaking, I’ve struggled with my weight for about twenty two years and most of that time was wasted, going through diet after diet that restricted too much, left me wanting and frustrated and ultimately, feeling like I am a loser and can never succeed. After 11 days of following this book and eating what I personally feel was a bit too indulgent of a menu, I’m down seven pounds. I know what you’re thinking: all water weight, and besides, wasn’t she just preaching that weight loss shouldn’t be sudden?! You’re right, it shouldn’t. But for one, I have a lot to lose and the more you have to lose, generally, the quicker you will drop pounds (at first). Second, I’ve completely cut out all snacking and all second helpings. Man, that adds up to a lot with just those two bad habits! Especially if you snack several times a day! The only other thing I’ve given up has been cream in my coffee and that, for me, was the biggest challenge because I love my coffee. But, for these first three months of “readjusting” how I do things, I don’t consider it that much of a burden to give up roughly 200 calories a day that used to be dedicated to cream in my coffee! I have even started to prefer it black with just a little sweetner (stevia, for those concerned). I haven’t been stressed about working out – I just have been taking more walks and enjoying the new, cooler fall weather and I’ve been pulling a few weeds here and there. This is my new life. I was done with diets a few years ago, but I was still engaging in bad habits. It’s hard to undo years of emotional eating, but I’ve found that the distraction of Olive is a grand one. Or, if I just HAVE to ingest something in the afternoon, I make a cup of cinnamon tea (it’s naturally sweet) and get productive! Preheat oven to 350F. Boil the asparagus in salted water for 5 minutes. Drain and let cool. Chop each stalk into a small dice and set aside. Saute the bacon in a nonstick frying pan till crisp. Drain on paper towel and set aside. Mix remaining ingredients in a large bowl (reserving some chives for garnish). Pour the egg mixture into individual ramekins. Sprinkle in the asparagus and bacon. Bake for 15-20 minutes till the custard is set but not dried out. Serve with pieces of toast, crackers, or with some fresh fruit and enjoy your day! 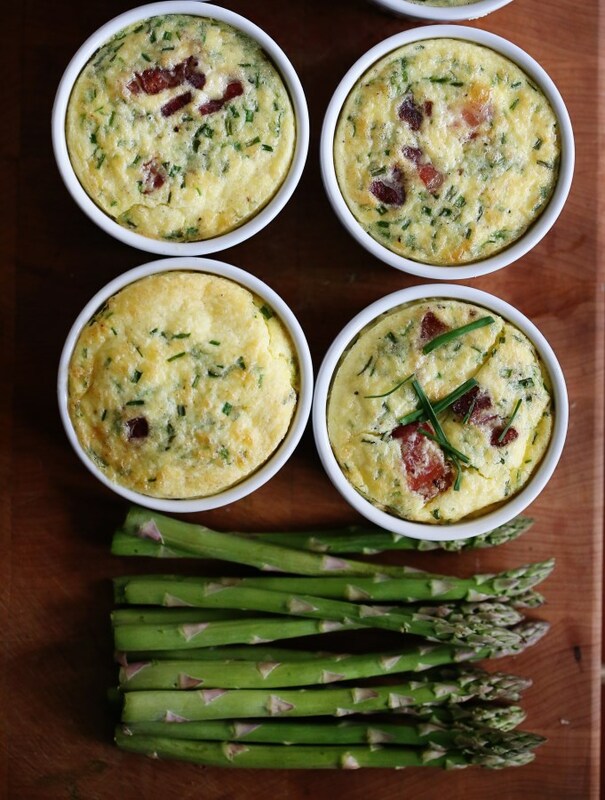 This entry was posted in Breakfast, Eggs are Awesome, Gluten Free for my friend, Healthy Meals, Hearty, Musings, Side Dishes, Vegetables and tagged asparagus, asparagus recipes, bacon, breakfast foods, breakfast recipes, chives, crustless quiche, custard, egg recipes, flan, Quiche. Bookmark the permalink. Awww, my dear sister. I have been pretty down lately because of weight. I feel a bit trapped with schedules and kids and no gym membership and only having a few quick, easy go-to meals for my family. We are in a rut, and I’m gaining instead of losing all the time with a dream of looking the way I feel inside. I have never been a yo-yo dieter. I don’t believe that they work, just as you pointed out, but I also don’t have the knowledge, or courage, to change. I like this recipe though, and look forward to hearing more about your journey in changing your lifestyle. I will be looking for that book, too :)! Shannon, the book is nice because it goes at such a gradual, real-life pace. The first two weeks are a self evaluation of what your pitfalls are (say a soda habit or eating one more helping than your body is actually hungry for) and then once you’ve established that, the next three months are about getting those bad habits under control, being a little less lenient with yourself and retraining your body to eat small portions and choose better snacks and all that good stuff. You live in such a great town for fresh produce, although I know that can be expensive at times, it really is affordable if you stick to what’s in season. I know it’s hard to think about retraining the boys, but I’d suggest just getting a new recipe a week into heavy rotation because with kids, familiarity = fondness. So the more they see butternut squash, the more they might accept it. Anyway, I could talk for days about the things I’ve read and learned and believe about all this. But I won’t. 🙂 However, if you have any questions or need suggestions, I’d love to help any way I can! How are you doing with this? Reading about your weight problems and the yoyo dieting was like reading about my life. I have walked in your shoes and come to the same conclusions. Am interested in how you are doing. Hey, Pat! Well, as you know, a lifetime of bad habits is hard to undo forever! Since writing that post in September, I went on to lose 12 pounds over the course of the following three months. Then…the HOLIDAYS. I was baking what seemed like every other day and it was very hard to limit sugar! So, since then, I haven’t dropped any more weight, but I am back on track after really, honestly, falling off the wagon! I am ready to re-read parts of that book, examine what things in my daily diet are causing me to stumble (sugar, snacking, as always) and I’m ready to be a little more strict! The beauty of no longer dieting is that you don’t have to “go on” a diet anymore. You find yourself gaining a few unwanted pounds, so you simply cut back in some areas and drink more water and try to move a little more. I find that I’m most successful if I just focus on the good decisions of each day instead of the week or the month or whatever. It’s hard, but it’s worth the effort! I wanted to note, also, that my 12 lb weight loss was kind of shocking. I felt like I was eating too much, actually. All I did to lose was switch to black coffee and stay away from snacking and lots of sugar. I cooked normally with my usual amounts of butter and still lost. It was nice to see common sense rewarded!